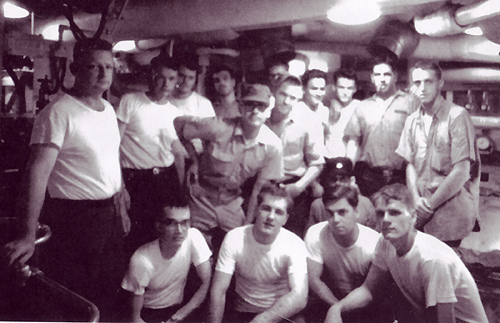 A recent mini- reunion was held of BTs from the USS DAVIDSON DE-1045 made up of boiler technicians aboard on first and second Westpac cruise, men mainly from the “Class of 67”. Some who we had contact with from that class sent their regrets that they could not attend for various reasons. Others we are still trying to find. All were remembered with honor they so richly deserve. Harold and Nida Kraft called, they had registered for the reunion but some health problems precluded their attendance to all our dismay. The hotel provided our group a nice meeting room for our stay and accommodations were really nice. It seemed the hotel staff laid out the red carpet for us as Viet Nam Veterans. It was a most pleasurable stay with them. Thursday afternoon after a buffet dinner in the meeting room provided by Elaine and Willie Segarra was enjoyed, memories flooded forth from all present of times spent together in the fireroom and aboard the ship, and recollections of fellow shipmates was treasured by all. to me back in Hawaii, and through the years. It was especially good to see them and hug them one more time. It was the same as I saw Michael, and when I saw Willie again after 40 years, as I heard “Hey Sailor” as I walked through the parking lot unloading the car, from Jim and Wanda Kelly, and then when Bob Ferguson walked in. We have had a lot of communications working on a special project for this reunion and I just barely met him aboard the last few months as he was starting his service aboard and I was finishing mine up. It was so good to meet the wives of the men I admired and would recall to Belinda throughout the years since. Photos were gone through, and various memorabilia looked at. USS DAVIDSON plaques (our special project) were presented to all present courtesy of Bob Ferguson and Russell Crosby. Russell Crosby also received a very special gift from Jim Kelly which was pretty ironic as well. I was the engineering yeoman as my other duties besides watch standing in the fireroom. Jim just happened to pick up a stapler out of the engineering log room before he left, which he had retained all these years, and that stapler he presented to me as a gift. Guess the last time I would have touched it was about 38 years ago. Now it is once again in my office, isn't that a hoot. A lot of the ship remains above the surface of the ocean due to many a shipmate's foresight and wish to have a memento of time served aboard. What a neat gift, and a treasured gesture from Jim. Steve Mitchell, the author of STEVE MCQUEEN WOULD BE PROUD provided me with some autographed copies of the his book to give to my fellow shipmates. Michael Martucci brought gifts for all from New York . One of my treasures is a Mustang T-Shirt. 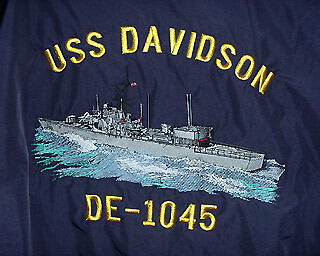 Another of Michael items on display at the reunion was a work of art in embroidery…………a USS DAVIDSON blue nylon jacket with the ship embroidered on the back in color with incredible detail, along with the American flag on the shoulder, and name on the front. What a treasure to behold there. This was the 40 th Anniversary of our first Westpac in 1967 and some of the men you see in the “Class of 67” of the fireroom personnel below. Some of our fellow BTs are no longer with us but were remembered and toasted with honor by us all at this gathering.